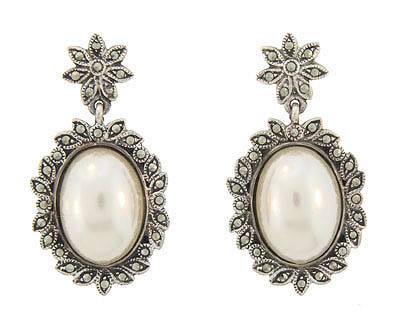 These sterling silver and marcasite earrings feature an oval shaped faux pearl surrounded by a leafy marcasite set frame. The elegant frame dangles from a single floral shaped post frosted with marcasites. The bridal earrings measure 1 1/2" long, 3/4" wide.